The MVP of prospecting products returns for another season of high quality rookie and prospects chasing this May. 2011 Bowman Baseball will bring much of the same that has made it one of the hobby's heavy hitters for the last decade, as well as some interesting new inclusions, including International Parallels, 1994 Bowman's Best inserts, Bowman Buyback Cut Signatures and 60th anniversary autographs. 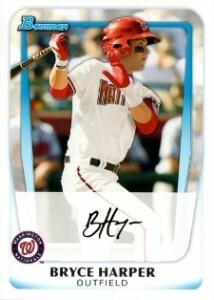 On a side note, Bryce Harper's first Bowman auto wearing an MLB uniform will appear in the product. 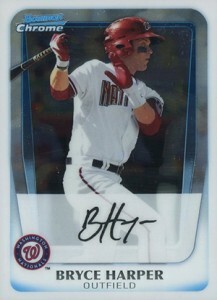 For over 60 years, Bowman has been the go-to brand for collectors who follow the game's top Rookies and Prospects.Bowman's home field advantage continues in 2011 as 30 Bowman Rookies and 110 Prospects take the field led by #1 Draft Pick Bryce Harper! Every autograph is on-card, not a single sticker drop among 'em! 220 card base set featuring 2011 MLB rookies, veterans and stars. 110 card prospect set in both the regular and chrome variety. New 1/1 Bowman Buyback Cut Signature Autographs - Book cards featuring an original 1948 or 1949 Bowman card paired with a cut signature! Bryce Harper's first Bowman autograph wearing an MLB uniform will find it's way into the product much like fellow National Steve Strasburg's did in 2010 Bowman Baseball. International Parallels - For the first time since the 90's, parallels featuring a backdrop map of a player's native country return to the Bowman brand name! Back are last year's "Topps 100 Prospects" inserts. 2010 Bowman featured a 1992 Bowman Baseball insert set featuring present day players, 2011 Bowman will continue the throwback tradition, only this time around 1994 Bowman's Best will be the subject. New inserts include "Topps of the Class" and "Finest Futures" cards! 60th Anniversary Autographs featuring stars past, present and future - Topps' year long Diamond Anniversary celebration comes to Bowman with each 60th anniversary card featuring a big name baseballer's inscription autograph! 2011 Bryce Harper RC AUTO Bowman Prospects BGS 9.5 9 Auto Phillies HOT!!!!! 5 cards. Hobby & Jumbo Only. 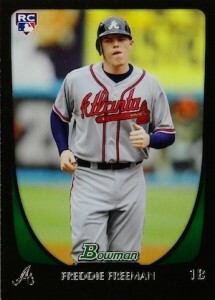 2011 Topps Baseball continuation insert. Good: Great auto checklist and good card design. Thankfully, fixed the Bowman chrome “bends" problem from 2010. Bad: You want to pull Bryce Harper, but you likely won't. But you're paying the Bryce Harper tax. Also, majority of each pack is the Bowman base set which while OK is not what you buy Bowman for. No Team USA cards this year. The Bottom Line: Topps wanted to repeat the level of success it had with 2010 Bowman on the shoulders of Steven Strasburg and thanks to Bryce Harper, 2011 Bowman has largely done just that. But even without Harper, this is a very complete product that contains enough desirable high profile prospect autographs in the product to keep everyone happy. The prospect set, chromes and autos are well designed, especially since the Bowman chrome bends have been fixed. While some like the base set, it's not what I buy the product for, so I believe too much of each pack is dedicated to cards I'll file awhile and likely never see again. The insert cards are mixed. The Topps of the Class and Bowman Brightest cards are decent, but the Bowman Best cards try too hard to be artsy, and just end up ugly. While I understand the split between Bowman chrome autos in hobby and Bowman autos in retail, I would prefer the more high end autos to be confined to chrome (e.g., Harper and Pineda). Topps is likely saving the Bowman Chrome auto of Harper for its 2011 Bowman Chrome product (ala Strasburg), but I feel Topps missed out by relegating Pineda to retail packs. I love the autograph checklist. Paul Goldschmidt, Dee Gordon, Jurickson Profar, Brandon Belt, Mike Pineda, Jeremy Hellickson, Stetson Allie, Jedd Gyorko…I could go on. There's even another Aroldis Chapman auto, for those of you who like following Cincinnati's Chapman experiment. Oh yeah, that Harper guy has an auto too. But I think I mentioned that thirteen times already. 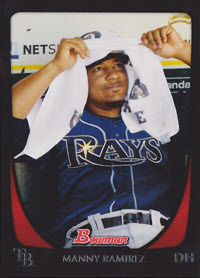 The base set has everybody a base set collector may want, and I'm not sure if this was intentional, but I think the Manny Ramirez card with the towel on his head (throwing in the towel anyone?) may be the most collectable. The hobby box price has leveled off to around $90 per box, which makes it less expensive that Bowman 2010, but still more expensive than previous Bowman products. Depending on which product you buy (hobby vs retail), you'll miss out on some autos. Harper and Pineda autos are only in retail, so for those loyal hobby box purchasers, you're pretty much relegated to hoping you pull a chrome (non-auto) prospect of Harper. And with retail odds worse than hobby box odds, the only place you'll likely see a Bowman Harper auto is on eBay. At this price point, and unless you feel lucky (only one auto per hobby box), it almost makes more sense to spend your $90 on a couple good, chrome prospect autos (refractor preferably), and wait a year to buy a complete 1-110 prospect set. Who am I kidding? This is one of the premier prospecting products…it's beyond fun to bust these boxes. We're going to buy the hobby box betting that we'll hit a gold, orange or red refractor auto of Goldschmidt or Gordon, with the assurance of also knowing the odds are good that we'll at least get Harper's BCP1 or a Harper insert (case in point: I didn't hit Goldschmidt or Gordon, but I did get a Harper insert). Then, we'll buy retail rack packs (from what I've heard, they have better odds than blaster boxes) in the hopes of getting a Harper or Pineda auto. And that's fine, because part of the Bowman product is the hope of hitting the big autograph. Everyone knows, it's better to dream about pulling a Harper auto from a pack, than to shell out over a hundred dollars on eBay for the same card. Daniel Dan Vogelbach 2011 Bowman BLACK REFRACTOR AUTO RC 25 Seattle Mariners!!! 2011 Bowman Baseball HOBBY Box 3 Box Lot Harper RC Auto Refractor?? 2011 Bowman Baseball JUMBO Box 2 Box Lot 6 Autos Harper RC Auto Refractor 25? This will be the first product I buy this season, and I CANNOT wait! Any chance we’re looking at a repeat of the “strasburg tax” with Harper? Also, I have to say I’m liking the inserts this year much more than last years. @David Tenneson: Yeah, those 1994 Bowman’s Best inserts are way cooler than the 1992 Bowman ones from last year. I want to see what one of the book card cut signatures looks like, from the way they explain it there’s a Bowman card in a book card with a cut signature. There’s a chance Harper creates a similar strasburg type stir, he’s a position player, I still can’t believe a pitcher reached the levels Strasburg did in 2010, it was out of control! looks great..going to be hard to top last years. like the futures game relics. I have been waiting on this since the season started last year. Looks like 2010 Draft got alot of the good players. Hosmer should make one of the Bowman checklists this year. Goldschmidt has been crushing and Belt should bounce back next time up. Jim � You could be right. The whole agreement between Topps and MLB regarding what constitutes an “official” rookie card is a bit confusing. At first glance it seems straightforward enough but each year there seems to be some exceptions to the guidelines that leave me scratching my head. i know last year they had donovan tate as a sp retail and then they did the same for draft with slade heathcott. Anyone know who is a SP in the retail auto checklist?